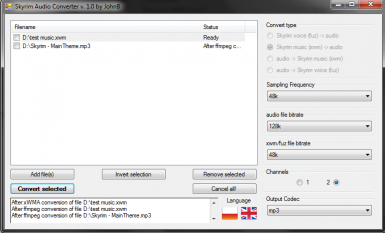 This handy tool allows you to work with audio files used in Skyrim (xwm and fuz) fast and easy. with audio rate 44.1k but only 1 channel, and leave the last one untouched. 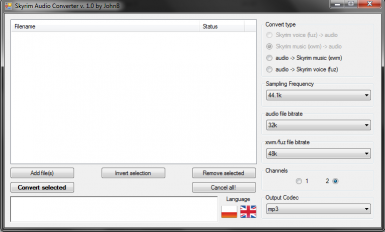 audio file will slow down the whole conversion proccess. None needed. To uninstall, just delete the whole program folder. If you happen to have problems on your x64 Windows 7, just download the optional file. When converting many files (40+) the program can freeze and seem to not respond. Just leave it for a moment, it should finish the work normally.